Five more sleeps until one of my favourite nights of the year: the night the world joins hands and turns off its lights - not to go to bed, but to wake up to the urgency of using less energy and protecting the Earth. What on earth is Earth Hour? Earth Hour is a one-hour event during which people interested in protecting the planet turn off all their lights. It was created by WWF-Australia in Sydney in 2007, when two million people and more than 2000 businesses got involved. Now Earth Hour is all grown up: it's a worldwide grassroots event embraced by people in 154 countries around the globe. Who wouldn't want to be part of that? When is it? Earth Hour 2014 will be on Saturday 29 March, 2014, at 8.30pm local time wherever you are. Why turn off the lights? WWF can answer this one: "Earth Hour aims to encourage an interconnected global community to share the opportunities and challenges of creating a sustainable world." The beauty of Earth Hour lies in its simplicity. To get involved, all you have to do is turn off all non-essential lights for an hour, wherever you are at 8.30pm next Saturday. Of course, it's more fun if you do that with friends or like-minded strangers, and there are thousands of Earth Hour events around the world. 1. Lights out for the Reef: In Australia, the focus of Earth Hour 2014 is saving the Great Barrier Reef from climate change and other man-made threats. 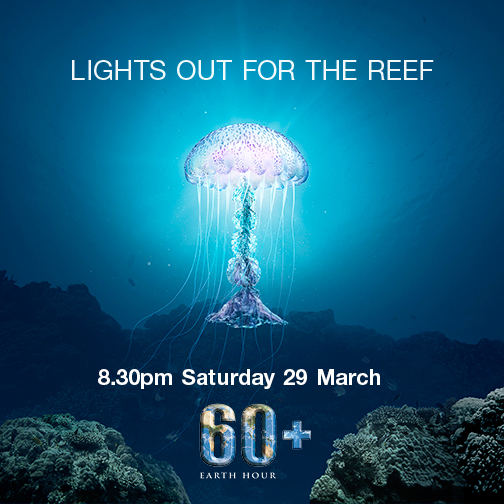 Earth Hour is joining with Channel Ten to screen a documentary about the Reef and why it is in danger, and this will be screened at Earth Hour events all over the country. See earthhour.org.au for more info. 2. Stretch your legs: Go for a walk and see how different (or not) things look in darkness: your street, the city skyline, local landmarks, your neighbours' houses, the night sky. 3. Salute to the moon: Yoga centres and hotels all over the world - from Yogatree in Canada to the Ritz-Carlton in Dubai - will be holding candle-lit Earth Hour yoga classes. Here in Sydney, Qi Yoga will be having a candle-lit kirtan (meditative chanting) class from 7pm to 9.30pm on Saturday night. 4. Starry, starry night sky: Make the most of the darkness to view the night sky in all its glory - by looking up, or by visiting your nearest observatory. Sydney Observatory, for instance, is hosting a "Don't be Afraid of the Dark" Earth Hour event with poetry and star-gazing. 6. Give some candle-love: Inspire someone else to turn off the lights by giving them a beautiful beeswax candle (soy candles are not as eco-friendly but are still better than regular, petrochemical-based candles). Byron Bay-based Northern Light is having a factory seconds sale right now. Or donate a candle ($5 each) to help WWF spell out a "Lights out for the Reef" message on the front lawn of Parliament House, Canberra. 7. Embrace your dark side: Vow to have a regular "electricity-free" night - perhaps once a week or once a month - when your entire household forgoes all devices, screens, tv, phones and electricity from dusk to dawn. I did a weekly electricity-free night during my No Impact month when I started this blog three years ago, and it was the most surprisingly enjoyable part of the whole project. So peaceful, fun and calming. What will you be doing this Saturday night at 8.30pm? I'm stocking up on candles and joining the Earth Hour gathering at Manly beach, in Sydney, where it all began. Maybe I'll see you there.